The title of forefather of today's all-electronic digital computers is usually awarded to ENIAC, which stood for Electronic Numerical Integrator and Calculator. 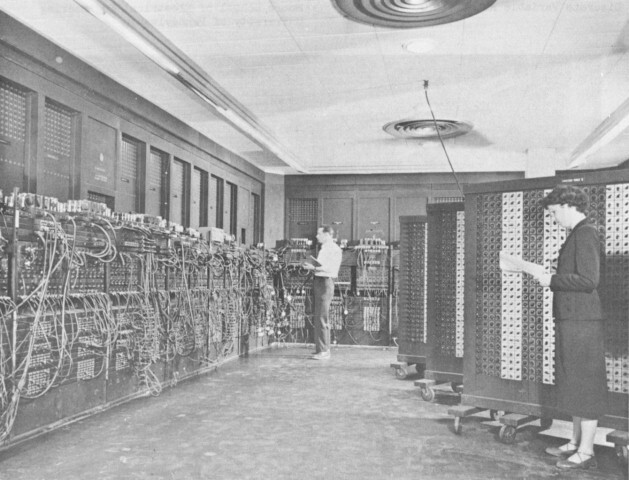 ENIAC was built at the University of Pennsylvania between 1943 and 1945 by two professors, John Mauchly and the 24 year old J. Presper Eckert, who got funding from the war department after promising they could build a machine that would replace all the "computers", meaning the women who were employed calculating the firing tables for the army's artillery guns. The day that Mauchly and Eckert saw the first small piece of ENIAC work, the persons they ran to bring to their lab to show off their progress were some of these female computers (one of whom remarked, "I was astounded that it took all this equipment to multiply 5 by 1000"). ENIAC filled a 20 by 40 foot room, weighed 30 tons, and used more than 18,000 vacuum tubes. 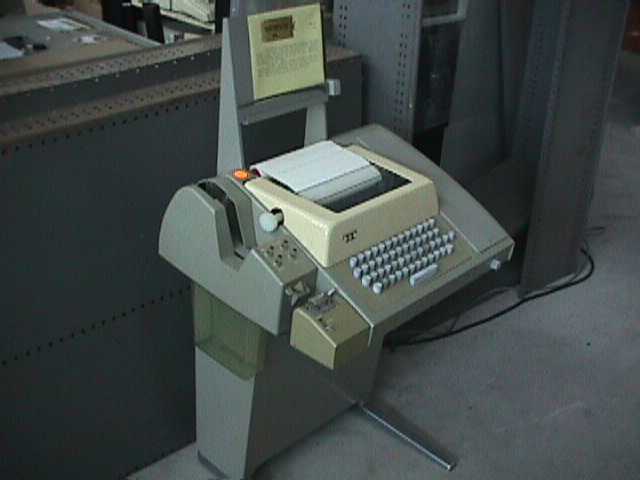 Like the Mark I, ENIAC employed paper card readers obtained from IBM (these were a regular product for IBM, as they were a long established part of business accounting machines, IBM's forte). When operating, the ENIAC was silent but you knew it was on as the 18,000 vacuum tubes each generated waste heat like a light bulb and all this heat (174,000 watts of heat) meant that the computer could only be operated in a specially designed room with its own heavy duty air conditioning system. Only the left half of ENIAC is visible in the first picture, the right half was basically a mirror image of what's visible. 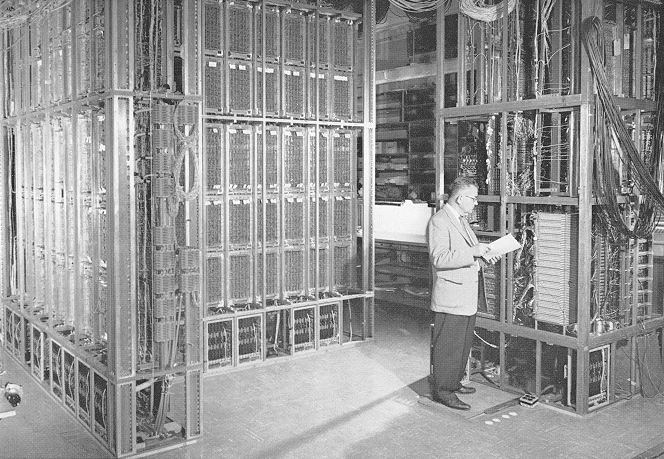 To perform this computation on ENIAC you had to rearrange a large number of patch cords and then locate three particular knobs on that vast wall of knobs and set them to 3, 1, and 4. Once the army agreed to fund ENIAC, Mauchly and Eckert worked around the clock, seven days a week, hoping to complete the machine in time to contribute to the war. Their war-time effort was so intense that most days they ate all 3 meals in the company of the army Captain who was their liaison with their military sponsors. They were allowed a small staff but soon observed that they could hire only the most junior members of the University of Pennsylvania staff because the more experienced faculty members knew that their proposed machine would never work. Even with 18,000 vacuum tubes, ENIAC could only hold 20 numbers at a time. However, thanks to the elimination of moving parts it ran much faster than the Mark I: a multiplication that required 6 seconds on the Mark I could be performed on ENIAC in 2.8 thousandths of a second. ENIAC's basic clock speed was 100,000 cycles per second. Today's home computers employ clock speeds of 1,000,000,000 cycles per second. Built with $500,000 from the U.S. Army, ENIAC's first task was to compute whether or not it was possible to build a hydrogen bomb (the atomic bomb was completed during the war and hence is older than ENIAC). The very first problem run on ENIAC required only 20 seconds and was checked against an answer obtained after forty hours of work with a mechanical calculator. After chewing on half a million punch cards for six weeks, ENIAC did humanity no favor when it declared the hydrogen bomb feasible. This first ENIAC program remains classified even today. Once ENIAC was finished and proved worthy of the cost of its development, its designers set about to eliminate the obnoxious fact that reprogramming the computer required a physical modification of all the patch cords and switches. It took days to change ENIAC's program. Eckert and Mauchly's next teamed up with the mathematician John von Neumann to design EDVAC, which pioneered the stored program. Because he was the first to publish a description of this new computer, von Neumann is often wrongly credited with the realization that the program (that is, the sequence of computation steps) could be represented electronically just as the data was. But this major breakthrough can be found in Eckert's notes long before he ever started working with von Neumann. Eckert was no slouch: while in high school Eckert had scored the second highest math SAT score in the entire country. After ENIAC and EDVAC came other computers with humorous names such as ILLIAC, JOHNNIAC, and, of course, MANIAC. ILLIAC was built at the University of Illinois at Champaign-Urbana, which is probably why the science fiction author Arthur C. Clarke chose to have the HAL computer of his famous book "2001: A Space Odyssey" born at Champaign-Urbana. Have you ever noticed that you can shift each of the letters of IBM backward by one alphabet position and get HAL? HAL from the movie "2001: A Space Odyssey". Look at the previous picture to understand why the movie makers in 1968 assumed computers of the future would be things you walk into. JOHNNIAC was a reference to John von Neumann, who was unquestionably a genius. At age 6 he could tell jokes in classical Greek. By 8 he was doing calculus. He could recite books he had read years earlier word for word. He could read a page of the phone directory and then recite it backwards. On one occasion it took von Neumann only 6 minutes to solve a problem in his head that another professor had spent hours on using a mechanical calculator. Von Neumann is perhaps most famous (infamous?) as the man who worked out the complicated method needed to detonate an atomic bomb. Once the computer's program was represented electronically, modifications to that program could happen as fast as the computer could compute. In fact, computer programs could now modify themselves while they ran (such programs are called self-modifying programs). This introduced a new way for a program to fail: faulty logic in the program could cause it to damage itself. This is one source of the general protection fault famous in MS-DOS and the blue screen of death famous in Windows. the analysis of the writing style in Shakespeare's work with the goal of proving whether a single individual really was responsible for all these pieces. By the end of the 1950's computers were no longer one-of-a-kind hand built devices owned only by universities and government research labs. Eckert and Mauchly left the University of Pennsylvania over a dispute about who owned the patents for their invention. They decided to set up their own company. 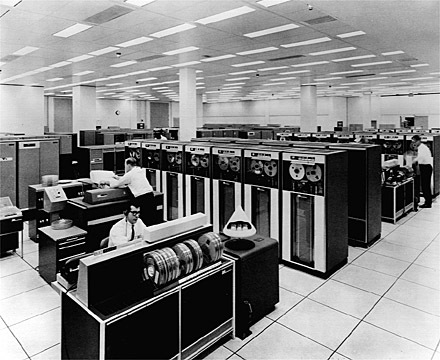 Their first product was the famous UNIVAC computer, the first commercial (that is, mass produced) computer. In the 50's, UNIVAC (a contraction of "Universal Automatic Computer") was the household word for "computer" just as "Kleenex" is for "tissue". The first UNIVAC was sold, appropriately enough, to the Census bureau. UNIVAC was also the first computer to employ magnetic tape. 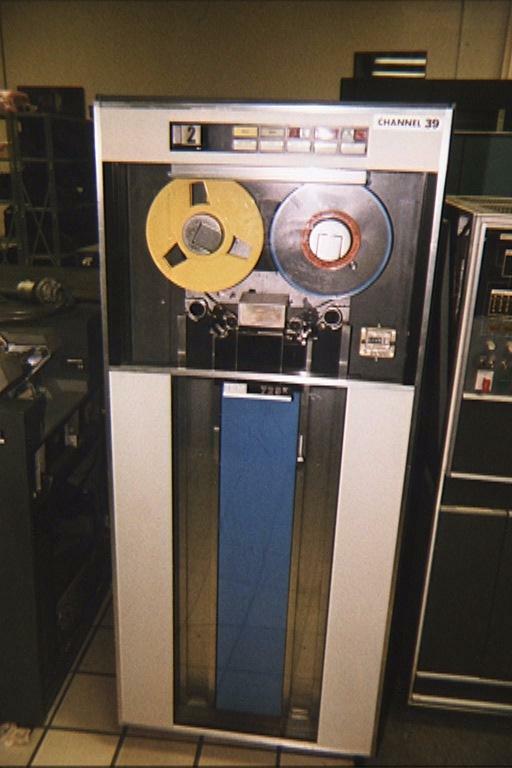 Many people still confuse a picture of a reel-to-reel tape recorder with a picture of a mainframe computer. 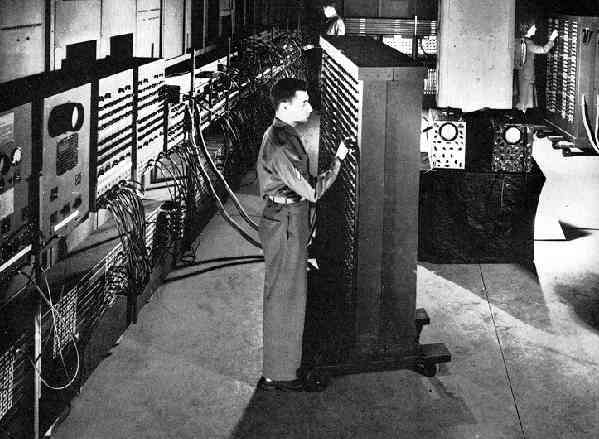 ENIAC was unquestionably the origin of the U.S. commercial computer industry, but its inventors, Mauchly and Eckert, never achieved fortune from their work and their company fell into financial problems and was sold at a loss. By 1955 IBM was selling more computers than UNIVAC and by the 1960's the group of eight companies selling computers was known as "IBM and the seven dwarfs". IBM grew so dominant that the federal government pursued anti-trust proceedings against them from 1969 to 1982 (notice the pace of our country's legal system). You might wonder what type of event is required to dislodge an industry heavyweight. In IBM's case it was their own decision to hire an unknown but aggressive firm called Microsoft to provide the software for their personal computer (PC). This lucrative contract allowed Microsoft to grow so dominant that by the year 2000 their market capitalization (the total value of their stock) was twice that of IBM and they were convicted in Federal Court of running an illegal monopoly. 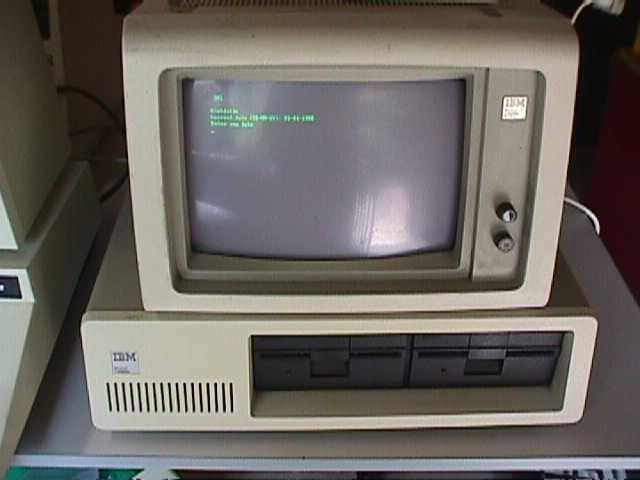 If you learned computer programming in the 1970's, you dealt with what today are called mainframe computers, such as the IBM 7090 (shown below), IBM 360, or IBM 370. 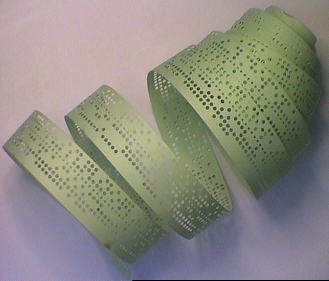 After observing the holes in paper tape it is perhaps obvious why all computers use binary numbers to represent data: a binary bit (that is, one digit of a binary number) can only have the value of 0 or 1 (just as a decimal digit can only have the value of 0 thru 9). Something which can only take two states is very easy to manufacture, control, and sense. In the case of paper tape, the hole has either been punched or it has not. Electro-mechanical computers such as the Mark I used relays to represent data because a relay (which is just a motor driven switch) can only be open or closed. The earliest all-electronic computers used vacuum tubes as switches: they too were either open or closed. Transistors replaced vacuum tubes because they too could act as switches but were smaller, cheaper, and consumed less power. Paper tape has a long history as well. It was first used as an information storage medium by Sir Charles Wheatstone, who used it to store Morse code that was arriving via the newly invented telegraph (incidentally, Wheatstone was also the inventor of the accordion). The alternative to time sharing was batch mode processing, where the computer gives its full attention to your program. 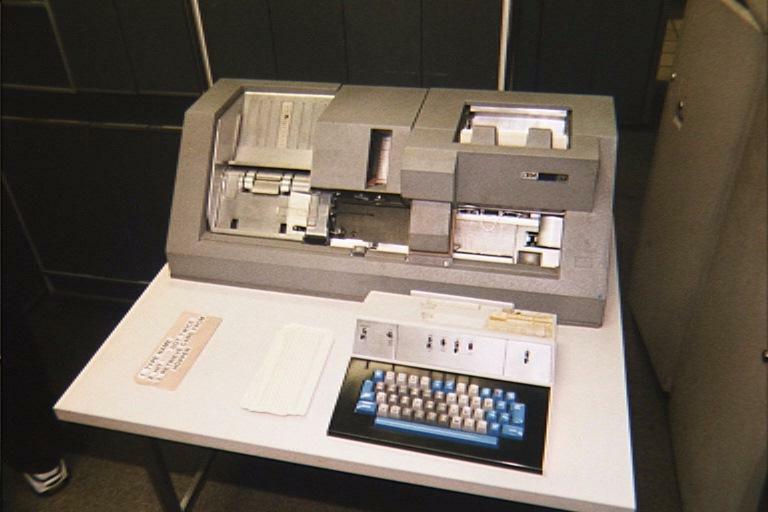 In exchange for getting the computer's full attention at run-time, you had to agree to prepare your program off-line on a key punch machine which generated punch cards. University students in the 1970's bought blank cards a linear foot at a time from the university bookstore. Each card could hold only 1 program statement. To submit your program to the mainframe, you placed your stack of cards in the hopper of a card reader. Your program would be run whenever the computer made it that far. You often submitted your deck and then went to dinner or to bed and came back later hoping to see a successful printout showing your results. Obviously, a program run in batch mode could not be interactive. But things changed fast. By the 1990's a university student would typically own his own computer and have exclusive use of it in his dorm room. This transformation was a result of the invention of the microprocessor. A microprocessor (uP) is a computer that is fabricated on an integrated circuit (IC). Computers had been around for 20 years before the first microprocessor was developed at Intel in 1971. The micro in the name microprocessor refers to the physical size. Intel didn't invent the electronic computer. But they were the first to succeed in cramming an entire computer on a single chip (IC). Intel was started in 1968 and initially produced only semiconductor memory (Intel invented both the DRAM and the EPROM, two memory technologies that are still going strong today). 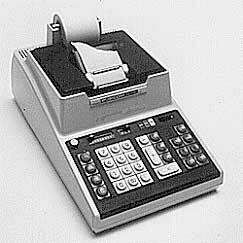 In 1969 they were approached by Busicom, a Japanese manufacturer of high performance calculators (these were typewriter sized units, the first shirt-pocket sized scientific calculator was the Hewlett-Packard HP35 introduced in 1972). Busicom wanted Intel to produce 12 custom calculator chips: one chip dedicated to the keyboard, another chip dedicated to the display, another for the printer, etc. But integrated circuits were (and are) expensive to design and this approach would have required Busicom to bear the full expense of developing 12 new chips since these 12 chips would only be of use to them. But a new Intel employee (Ted Hoff) convinced Busicom to instead accept a general purpose computer chip which, like all computers, could be reprogrammed for many different tasks (like controlling a keyboard, a display, a printer, etc.). Intel argued that since the chip could be reprogrammed for alternative purposes, the cost of developing it could be spread out over more users and hence would be less expensive to each user. The general purpose computer is adapted to each new purpose by writing a program which is a sequence of instructions stored in memory (which happened to be Intel's forte). Busicom agreed to pay Intel to design a general purpose chip and to get a price break since it would allow Intel to sell the resulting chip to others. But development of the chip took longer than expected and Busicom pulled out of the project. Intel knew it had a winner by that point and gladly refunded all of Busicom's investment just to gain sole rights to the device which they finished on their own. Thus became the Intel 4004, the first microprocessor (uP). The 4004 consisted of 2300 transistors and was clocked at 108 kHz (i.e., 108,000 times per second). Compare this to the 42 million transistors and the 2 GHz clock rate (i.e., 2,000,000,000 times per second) used in a Pentium 4. One of Intel's 4004 chips still functions aboard the Pioneer 10 spacecraft, which is now the man-made object farthest from the earth. Curiously, Busicom went bankrupt and never ended up using the ground-breaking microprocessor. Intel followed the 4004 with the 8008 and 8080. Intel priced the 8080 microprocessor at $360 dollars as an insult to IBM's famous 360 mainframe which cost millions of dollars. The 8080 was employed in the MITS Altair computer, which was the world's first personal computer (PC). It was personal all right: you had to build it yourself from a kit of parts that arrived in the mail. This kit didn't even include an enclosure and that is the reason the unit shown below doesn't match the picture on the magazine cover. 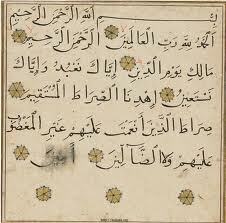 A Harvard freshman by the name of Bill Gates decided to drop out of college so he could concentrate all his time writing programs for this computer. This early experienced put Bill Gates in the right place at the right time once IBM decided to standardize on the Intel microprocessors for their line of PCs in 1981. The Intel Pentium 4 used in today's PCs is still compatible with the Intel 8088 used in IBM's first PC. If you've enjoyed this history of computers, I encourage you to try your own hand at programming a computer. That is the only way you will really come to understand the concepts of looping, subroutines, high and low-level languages, bits and bytes, etc. I have written a number of Windows programs which teach computer programming in a fun, visually-engaging setting. I start my students on a programmable RPN calculator where we learn about programs, statements, program and data memory, subroutines, logic and syntax errors, stacks, etc. Then we move on to an 8051 microprocessor (which happens to be the most widespread microprocessor on earth) where we learn about microprocessors, bits and bytes, assembly language, addressing modes, etc. Finally, we graduate to the most powerful language in use today: C++ (pronounced "C plus plus"). These Windows programs are accompanied by a book's worth of on-line documentation which serves as a self-study guide, allowing you to teach yourself computer programming! The home page (URL) for this collection of software is www.computersciencelab.com. "ENIAC: The Triumphs and Tragedies of the World's First Computer" by Scott McCartney. Who Created the Internet Network?